One of the best things that we can do with our paper crafting is to let others know that we are thinking of them. One of the important times to do that is when we want to extend sympathy. I like to have a few sympathy cards on hand so that when I need them, I can send them immediately. Here is a simple and beautiful layout that works so well with the gorgeous Floral Romance SpecialtyDSP. This DSP has some stunning choices. Some are a heavily printed vellum, and others are two-sided with a felt like feel. All you need to add is a sentiment and an embellishment or two and voila. Card Base 4 1/4" x 11", scored at 5 1/2". 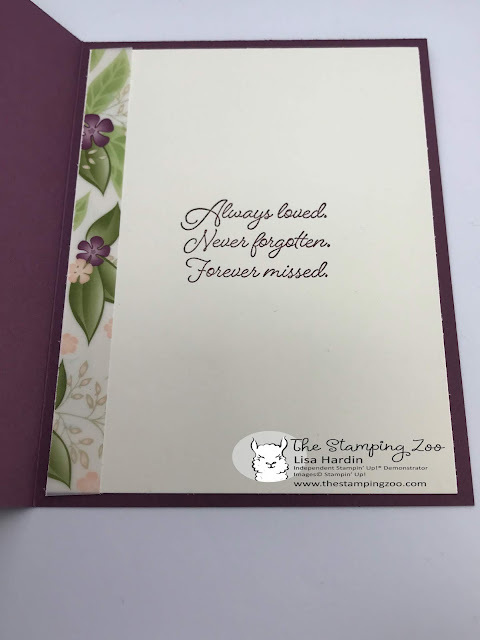 Card front and insert cut from Very Vanilla or Whisper White, measuring 4" x 5 1/4". DSP cut at 3 1/2" X 4 3/4". Scrap of DSP for the inside, and scrap of Very Vanilla or Whisper White for the sentiment on the front, 1" wide with allowance on either side for using the Banner Triple Punch. The construction is very straightforward so I won't post detailed instructions. I have popped the sentiment up on Dimensionals, and added a mini-dimensional to the left side of the Floral Romance Seal. 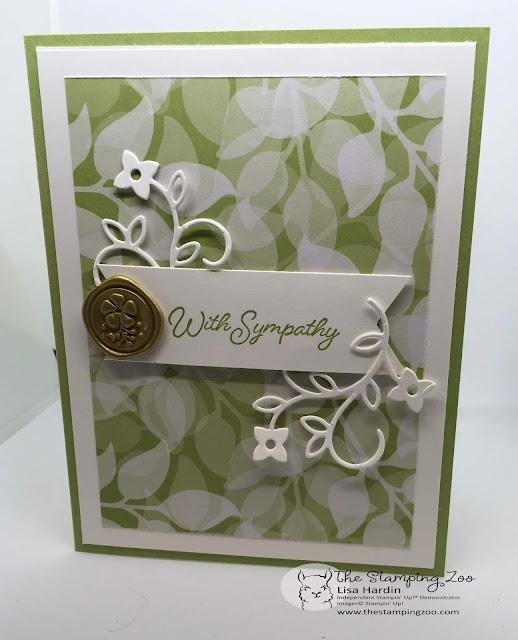 I die cut the beautiful scroll and flower die cuts from the new Well Written Framelits Dies. This set has 14 words to die cut, as well as 10 additional images. It's a must have, and it also has a coordinating stamp set (51 sentiment stamps!). With this bundle in your arsenal you will never have to look for the perfect sentiment again. And, when bundled, you can take a 10% discount! For the inside I used a scrap of the DSP along with another perfect sentiment. I went to the stamp set Flowing Fountain for just the right thing to say. Thanks for visiting The Stamping Zoo. I hope you make this card for sympathy or other reasons. If you have any questions please contact me. See you next time!